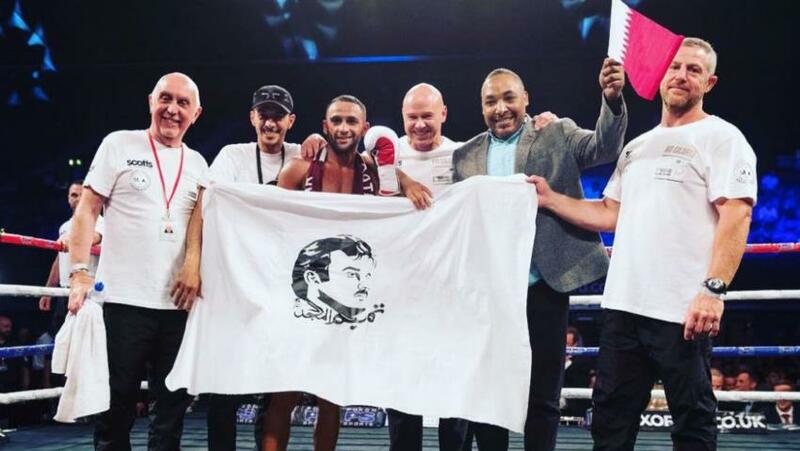 British boxer Abdul Barry Awad aka “Kid Galahad” praised the Qatari ruler and the entire Qatar nation, now isolated by neighbors for alleged funding of terrorism, after his victory over Mexican Jose Cayetano for the IBF Inter-Continental featherweight title over the weekend. Awad beat his rival in the 10th round of the bout though he had not fought since February; his easy three round KO over Leonel Hernandex. Awad, of Yemeni descent, was born in Doha before moving to Liverpool at the age of four with his grandparents, his brother told media. 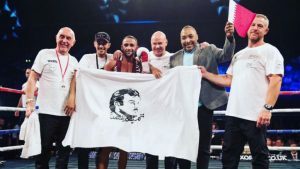 The British boxer entered the ring on Saturday draped in a Qatar scarf and with his team carrying flags of the emirate and a banner of Emir Tamim bin Hamad Al-Thani, London-based The New Arab reports. In a post-fight interview, Awad expressed thanks to “my Qatari people and to Sheikh Tamim”. “We all support Qatar during this crisis and have always supported the country, we still have lots of family there,” he said. The 27-year old boxer met with Qatari ambassador to London who congratulated him over his victory. The diplomat also thanked him for supporting Qatar. Qatar has been tossed out of the Gulf family after Saudi Arabia, United Arab Emirates (UAE), Bahrain and Egypt have isolated the tiny-gas rich country over its alleged support for terrorism and interference in their internal affairs. The four boycotting countries have also denied Qatari nationals access to their land, sea and airspace. The bloc has also banned their citizens from sympathizing with Doha. Any attempt has been deemed as a criminal offence and can land one in prison. Several athletes have sided with Qatar in the diplomatic showdown with its neighbors. Former Barcelona midfielder Xavi Hernandez, who now plays for Qatari club al-Sadd, last month called for an end to the crisis, the worst to hit the region since the establishment of the GCC in 1981, the New Arab reports.